Harod Spring lies at the foot of Mount Gilboa, about 15 miles south of Nazareth in northern Israel. The victorious soldiers for a decisive Biblical battle in the nearby Jezreel Valley were chosen by how they drank from the spring. According to the Book of Judges, nomadic Midianites from the east had repeatedly invaded Israel on camels, killing Israelites and stealing their crops and animals. On one occasion, a large contingent of Midianites was encamped in the Jezreel Valley, preparing for another raid. Gideon, a local leader, assembled 32,000 men at the base of Mount Gilboa, planning a direct attack. God appeared to Gideon, telling him to send home 22,000 men who were afraid to fight the better equipped and more numerous Midianites. 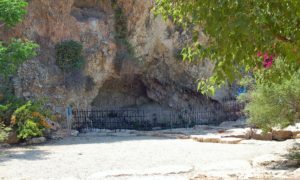 God then told Gideon to observe the remaining troops as they drank from Harod Spring, which flows from Mount Gilboa through a cavern opening. Three hundred of Gideon’s men, apparently prone, lapped water from the spring like dogs, using their cupped hands. The rest of the 10,000 men knelt to drink. At God’s instruction, Gideon sent the kneelers back to their homes and trained the lappers for a daring raid on the Midianites. One night, the 300 raiders, divided into groups of 100, surrounded and then entered the Midianite camp, carrying torches and blowing horns. The startled Midianites scurried from their camp in all directions, killing each other in the ensuing melee. The men Gideon had sent home, joined by other Israelites, eventually annihilated the lost and widely-disbursed Midianites. Gideon himself killed two captured Midianite kings whose earlier victims had included his brothers. Today, Harod Spring is within Ma’ayan Harod National Park. A park sign tells about Gideon’s famous drinking test, but a fence in front of the cavern opening prevents visitors from trying out alternative techniques.